There is a not-so-little island off the coast of Spain which is doing its best to turn itself into a golfer’s paradise, and such is the progress being made that some are already calling it ‘The Miracle of Mallorca’. The largest of the Balearic islands is long established as one of the more popular summer destinations for Irish holiday-makers – mainly because of its many sandy beaches, acres of untouched natural beauty, and array of family-fun facilities. But there is much more to this Spanish jewel in the Mediterranean sun, and golf is an area of the tourist industry that is determined to shine more brightly. In an effort to harness this potential, two of their German-owned golf courses have teamed up with a recently opened hotel and spa resort, Hotel Carossa, to attract more Irish golfers to this enchanting part of the world. Aided by the presence of that big golden ball in the sky, they don’t have to try too hard to persuade you to give a it a whirl. Son Gual is the island’s flagship course that will tickle the tastebuds of your average club golfer, while its challenging layout is one that will the test every single-figure handicapper. Rated seventh in Spain and 42nd in Europe in the prestigious 2018 Top 100 Courses of the Continent, this magnificent venue has an intriguing back story. German millionaire Adam Pamer loved visiting Mallorca and loved playing golf, but felt the island was in need of a premier course. Back in 1995 he decided to invest some of his hard-earned marks in a high-quality track that would appeal to everyone. He duly engaged the services of designer Thomas Himmel to make his dream a reality, and it proved a wise choice. The designer delivered in spades and since it first opened its fairways in 2007, it has become a mecca for golfers visiting Mallorca. Located within a 15-minute drive of Palma airport, it is set on 160 hectares of gently rolling land and while its key feature is the proliferation of bunkers (every tee bar one offers a test of sand), this classic par 72 with four par-fives and four par-threes also has it share of lakes and streams to avoid, as well as being peppered by 800 olive trees. The official welcome note to Son Gual promises that you can “cast off all the stress of everyday life”, which is probably true for most club golfers. However, if you have the swing of a slow, one-sided junior B hurler and the putting stroke of an inebriated croquet player, like me, then you’re sure to encounter the stress of losing plenty of balls along the way. This is a real thinking-man’s course as the superb layout challenges your brain on the tee box. From the elevated first tee, you will be tempted – go with driver over a big bunker or lay up and give yourself a more difficult second into the green. It was a similar story on my favourite hole, the par-five sixth, which has an appealing tee-shot where you have to drive over a lake that gradually widens at the other side. Be brave with the driver and you have to clear 180 metres to land on a wide fairway, or go short with an iron to clear 120 metres and find land but be faced with a long haul to an elevated green. The signature hole is the 18th, also a par-five with plenty water and again requiring the golfer to put on his thinking cap from the tee-box. There’s a testy carry over a stream from the tee, but you must be straight as there is water down the left-hand side of the landing area before the stream crosses the fairway, widens and travels up the right hand side. Just under the green, the stream becomes a pond and it makes for a picturesque setting under the magnificent Palacio clubhouse. Our other venue on the trip was the Alcanada course, which is situated in the north-east of the island in a breathtaking location overlooking the Bay of Alcudia. With a traditional lighthouse just offshore from which the club takes its name, Alcanada’s 7,108-yard 18-hole championship course was designed by award-winning golf architect Robert Trent Jones Jnr. Owned by the Porsche family, it’s hard not to fall in love with this most picturesque of courses, which boasts a beautiful old-style terraced clubhouse, allowing visitors to enjoy the stunning views. The course itself was right up my street, with the opening dog-leg, par-five (which has echoes of the famous 13th at Augusta) setting the tone for a wonderful challenge. The views become more and more spectacular as you travel around the course, with the high point being the location of the raised 13th tee-box. As you look out it’s like a picture postcard and you can drive down towards the bay with the lighthouse in full view. Our genial host, director of golf Kristoff Both, told us they plan to redevelop the greens with an investment of close to a €1m during the current off-season. When the work is finished, it’s current standing of 81 in Europe’s Top 100 should jump considerably and make it well worth checking out in 2019. 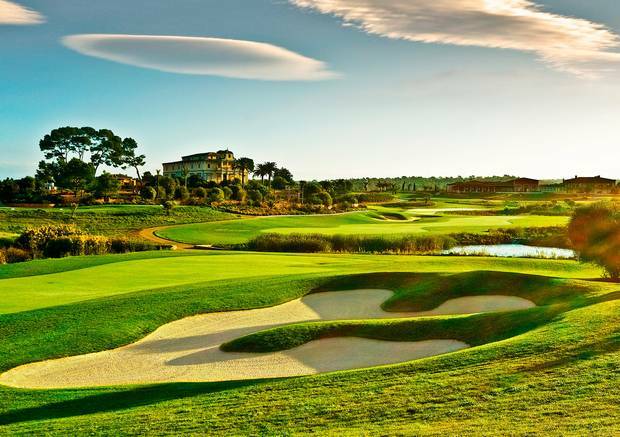 There are many options for places to stay in Majorca, but if you want to do it in style, then The Carrossa Resort is the ideal one for golfers playing Son Gual and Alcanada. Located in the beautiful Llevant Hills, it is a 30-minute drive from both courses and far away from mass tourism. This recently opened hotel, owned by the Hamachers from Cologne who are a successful hotelier family, has teamed up with Son Gual and Alcanada to offer an attractive premier golf package which includes gourmet half-board and four sets of green feens. Offering the finest cuisine, Carossa has an array of first-class services and facilities, including a luxury spa and indoor pool, massage and beauty treatments, gym, luscious gardens with a heated outdoor infinity pool and poolside bar – all this with the benefit of keeping in touch with home thanks to free Wi-Fi. The deal starts at a price of €1,139, which is value for money considering the level of hospitality. For more, visit: carrossa.com. Situated along the bay of Alcudia in the municipality of Santa Margalida this town is full of sun, fun and summer buzz. The major attraction of Can Picafort is the beach and all the activities which revolve around it. The beach here is white and sandy with clear water and has all the facilities you would expect to make it family-friendly. Can Picafort is close to many early Bronze Age settlements, so has a very ancient history. Located in the town of Muro, near Alcúdia, on the northeast coast of the island, each of the four beaches that make-up Playa de Muro are white sand, some with sand dunes. Enjoy your vacation with Best Transfers Mallorca! You plan a tour in Palma da Mallorca? We’ll guide you through the magnificent beauty of the island and show you the charming local peculiarities and you’ll be enchanted by this place! Easy booking. Only one minute! You pay directly to your driver!! The shopping in Can Picafort is geared towards holiday makers in search of fun, sun and souvenirs. There is also a weekly market on Friday mornings. A list of the daily markets taking place all over the island of Mallorca selling lots of interesting local produce and great souvenirs to take home. During peak season this beach is also incredibly busy and crowded. A little further away from the main beach is the quieter beach of ‘Playa de Muro’ which is surrounded by sand dunes. You will also find plenty of entertainment and organised sports in Can Picafort. For those interested in history and culture you do not have to travel far to find it with regular day trips being available to quieter parts of Northern Mallorca. There are many more traditional towns nearby. The wild life reserve of S’Albufera is internationally renowned among bird watchers and consists of marsh and salt lands with many species of birds and other animals. The Tramuntana mountain range is also within travelling distance. The resident community of Banyalbufar is small, but this area boasts many visitors attracted by the island’s hidden places, steeped in history and authentic Mallorcan culture. The name Banyalbufar is a combination of Moorish and Catalan and means founded by the sea. Best Transfers for the best trips! Surrounded by the towering peaks of the Tramuntana mountain range, this quaint Mallorcan district nestles among four smaller peaks, where scattered farms and vineyards scale the heights around the historic town centre. As well as winding village streets and historic agricultural systems, there is the working fishing port of Es Port de Canonge and a number of coves and beaches for sunbathing and swimming. These include: Cala Banyalbufar, Es Corral Fals and Son Bunyola. The neighbouring town of Estellencs on the slopes of the mountain Galatzo is also too close by to miss visiting. We hope you enjoy our abcMallorca guide to Banyalbufar. The name Banyalbufar is a combination of Moorish and Catalan and means founded by the sea. This area was inhabited and cultivated by the Moors in the 10th century who created around 2000 terraces on the mountain slopes and a sophisticated irrigation system of aqueducts which still work today. The area was famous for the cultivation of the highly prized Malvasier or Malvasia grape variety for wine production, which modern vintners in Banyalbufar are now successfully re-establish. It is said that this wine was highly prized by the King of Aragon and was a motivating factor in the re-conquest of Mallorca by Jaume I. Today Banyalbufar remains a quiet place surrounded by many other charming mountain villages to explore. The journey to Banyalbufar and its surrounding villages is an attraction in its own right. The magnificent views, along the winding roads which stretch down to the coast are breathtaking, with mountain peaks and dramatic rock structures. Take time to enjoy the historic surroundings and explore the various coves and beaches. As well as the charming town centre there is a pretty waterfall and the historic tower called Tour de Ses Animes which was built to provide protection from pirate attacks in the 17th century. The surrounding area also contains other villages of note such as the pretty village of Estellencs which is popular with hikers and bikers. Free Changes! Free cancellation! Direct payment to the driver! If you have some special ideas or interests – just share with us and we’ll show you the right place. This lovely narrow beach, on the Formentor peninsula, is lined with pine trees. Cala Torta which is close to Artà, is one of the most appealing undeveloped beaches on Mallorca. There are 262 beaches on Mallorca with a total length of 50 km. The editors of luxury lifestyle magazine abcMallorca have selected the top 20 beaches on Mallorca for you: lonely calas, sandy family beaches or rocky bays…enjoy Mallorca’s amazing coastline! This lovely narrow beach, on the Formentor peninsula, is lined with pine trees. You’re always close to the clear sparkling water of the Mediterranean when you want to cool off, and the views across the Bay of Pollensa – with boats bobbing nearby – are dreamy. You can arrive here by boat from Puerto Pollensa or by car (stopping along the peninsula road to admire some spectacular scenery). The Barceló Hotel Formentor is located here. This small sheltered beach has sparkling clean water and soft golden sand, and is one of the more attractive beaches on the coastline to the southwest of Palma. It’s not a very large beach, so we recommend arriving early to stake your claim to a patch of this paradise. You can hire sun loungers and parasols on the sands or chill out at one of the two good beach clubs – Virtual Club and Las Terrazas – serving this popular resort. This small stony beach is a tranquil spot even during high season. It offers easy access to the adjoining rock caves with good diving, snorkelling and swimming. Our tip: fill your picnic basket and spend a summer evening at the beach – the sunsets are unrivalled! The small gravel beach is embedded in a romantic cave with steep rock faces. With its often rough waves it is the ideal diving and windsurfing ground for experienced sportsmen. Not suitable for children. The sandy beach of Puerto Pollensa with its shady promenade is long, falling off gently and offers a wide choice of water sport activities. It is said to be one of the finest wind surfing areas on the island. Nice restaurants, cafés and shopping facilities are all in close reach. Many consider the long stretch of Playa de Llenaire to be one of the best beaches on Mallorca, situated within a wonderful bay. Lots of poets and painters have been inspired by the beauty of Puerto de Pollensa. The bay of Alcúdia is Mallorca’s longest beach and is among the best developed areas for resorts and hotels in every price range. The good infrastructure, the wide offer of water sport activities and the flat beach make it ideal for families. Cala Torta which is close to Artà, is one of the most appealing undeveloped beaches on Mallorca. Scuba-diving and snorkelling are highly recommended in this area. All of these three beaches are quite remote so be prepared for a bumpy ride through a small mountain range which takes about 25-30 minute on a road full of huge potholes. The reward is a virtually deserted white beach with crystal clear water. A small restaurant offers freshly caught fish and seafood from the Mallorcan waters. Perhaps one of best places to relax on the island. Directions: Drive out of Artà on the road to Capdepera and the beaches are signed on a small road on the left just past a petrol station.